Although one of the main reasons for the Khatumo State creation was to avoid conflict, Somaliland and Puntland destabilized the area with conflicting claims based on a shared clan of peoples by Puntland, and long-gone common colonial borders by Somaliland. Both claims are in conflict with the expressed wishes of the people of Khatumo to set up their own comparable state and would lead to continued instability and insecurity. The Government of the Republic of Somaliland signed a historic unity agreement with a rebel organization based in south-eastern Somaliland on 22 July 2017. Khatumo State, a rebel organization that has been fighting for autonomy since 2012, agreed to put down arms and unite with the rest of the country after holding several peace talks. Somaliland's Foreign Minister, Saad Ali Shire, announced the main principles of the agreement in a joint press conference with Khatumo leaders. "The unity agreement is centered on five main principles: National unity, power-sharing, living together in peace, national development and uniting against all external threats" Shire said. Khatumo leader, Ali Khalif Galaydh, saids his decision to unite with the rest of Somaliland was motivated by the lack of development in the Sool and Ayn regions. "NGOs never used to come to our regions due to safety concerns. We have decided that development and living in peace is more important than fighting" Galaydh said. The peaceful reconciliation process between Khatumo and Somaliland initiated in Addis Ababa Ethiopia earlier in 2017 and subsequent phases hosted by Djibouti culminated on 17 June 2017 in Hargeisa where a five point agreement was jointly signed. The accords included a quota system that avails all stakeholders’ access to political, judiciary and government representation as well public services at all levels in the country. It also called for devolution of government from national, regional to district levels that fully empowers the various levels with a decentralized management and subsequent services provision. The Khatumo state Somalia Guurti, Council of traditional leaders, immediately upon announcement of reconciliation accords between Somaliland and Khatumo in Hargeisa, stated 18 June 2017 that the Council of traditional leaders is the highest authority and is the only body that can ratify any agreements that can impact on the existential issues facing the people of the Khatumo State of Somalia including any agreement with Somaliland, Puntland or any other entity. The council accused the Somaliland government and authorities in the Puntland Somalia administrative region of exacerbating and sustaining never ending bloodshed as a result of the two’s jurisdictional tug of war. 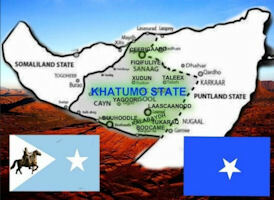 Khatumo state consists of Sool, Sanaag and Ayn (SSC) provinces in Somalia, between the semi-autonomous region of Puntland and the breakaway state of Somaliland. Its aim is to create an independent administration in the northern region of Somalia. Unlike Somaliland, it does not seek complete autonomy and is willing to unite with the rest of Somalia under a federal government structure and still flies the Somali flag along with its own flag. 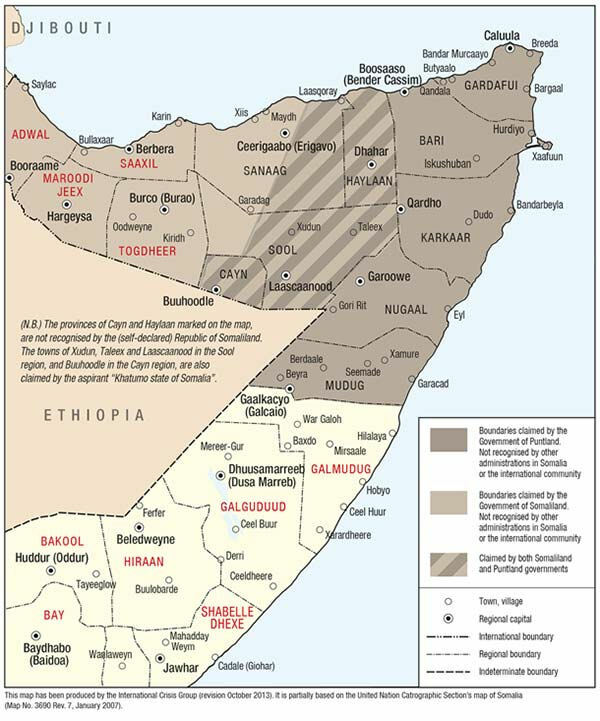 Sool and Sanaag regions have been highly disputed by both Puntland and the breakaway state of Somaliland and each claims the entirety of the Khatumo. 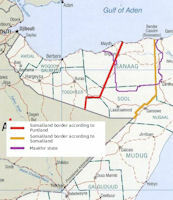 There have been numerous clashes between Puntland and Somaliland. Khatumo is the result of the efforts of residents of Sool, Sanaag and Ayn regions to create their own administration. They are largely members of the Dulbahante sub-clan of the Harti (Darod) who dominate these regions. Efforts establish this independent administration, began in 2007, and eventually resulted in a cornerstone meeting in Taleh in December 2011 where Khatumo was officially declared. In January 2012, a second conference held in Taleh where prominent politicians, traditional leaders and other residents debated the issue. On January 12, 2012, the state of Khatumo was finalized after involved parties agreed that an independent administration would allow for development and stability of the regions. The name 'Khatumo' is derived from the Arabic word which implies a ‘positive conclusion.’ Officials stated that their objective is to end or eliminate the problems of the region with their own administration and leadership. The western border is Labida, 20km from Buro. The northern border is Jiidale, a small village in Erigavo area. To the east lies Yooada which is near Garowe and on the west is Buhoodle in Ayn region which shares a border with Ethiopia. 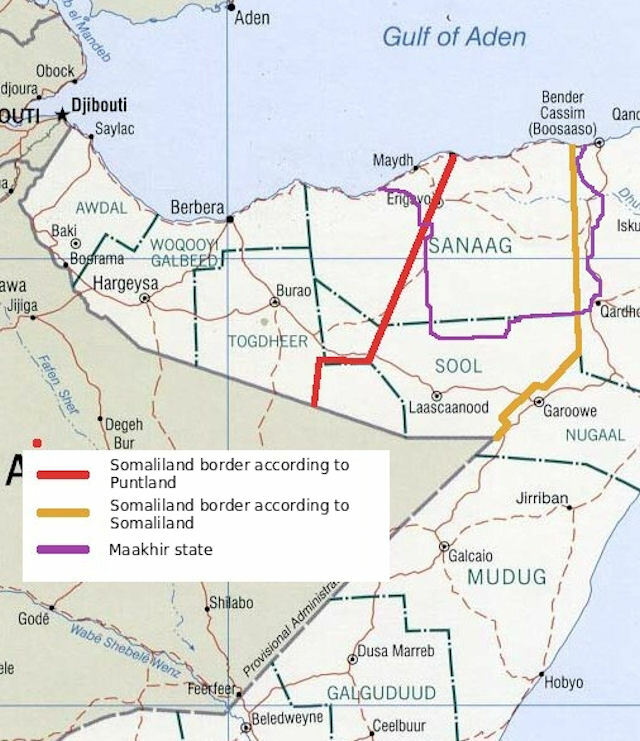 Despite their claim over these boundaries, by 2012 the new administration was only established in Ayn region, and some areas in Sool while Somaliland still controlled Las-Anod city which is the capital of Sool. Khatumo officials hoped to replace the Somaliland and Puntland troops from all the regions as they prepare independent forces and security to take control of their areas. Sool region which includes Xudun, Bocame and Las Anod districts. Ayn region has Buhoodle, Horufadhi and Widhwidh districts while Sanaag region consists of Erigavo District, Fuqi-Fuliye and Awrbogeys districts. These districts are not what was originally set up by the Somali Central Government in the 1990s but Khatumo officials insist that they were identified and awaiting approval by the concerned officials before the collapse of the Siad Barre regime. Somalia’s former Prime Minister Ali Khalif Galaydh, of the Dhulbahante clan played a key role in the creation of Khatumo. He attended a series of meetings until the final Taleh conference. Galaydh was not part of the administration, but was lobbying for the support of the new administration. He was involved in the process which granted Khatumo a mandate from the TFG. Galaydh was part of the administration of President Abdiqasim Salad Hassan in 2000. Among the elders and traditional leaders, Garaad Jama Garaad is an influential leader who worked hard for the establishment of Khatumo. He played the key role of advising and negotiating with the residents of Khatumo to seek their own leadership and administration. The structure of Khatumo state is rather different from other semi-autonomous regions or states as it has three presidents and four councils that are establishing key governing sectors. In this unique set up, the three leaders will govern for 18 months and in line with a power sharing deal. Most decisions affecting the regions are made after consultation. For a period of six months, each one of them will be a chairman and represent the rest. This post will rotate for 18 months after which parliament will be established and elections announced. The three leaders are members of the Dulbahante which is the largest clan in all the regions. Khatumo officials believed that the three president set up allows any potential leader to adequately showcase their skills and achieve more for the country through concerted efforts. Two of the three presidents are well known in the region and have worked with other administrations as ministers. President Ahmed Eli Osman was formerly the Puntland Minister for Aviation in 2009. President Abdinur Elmi Qaaji was the Minister for sports for former Puntland administration which was led by Adde Musse Hirsi. President Mohamed Yusuf Jama is a member of the Diaspora. Khatumo officials prepared troops and are recruiting more since the declaration of the state in January 2012. The exact numbers of their soldiers was unavailable. The state administration paid for their salaries without foreign support. 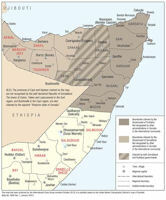 The members of the forces were previously involved in military operations against Somaliland’s troops. Khatumo administration has a lot of local support especially among the Dhulbahante clan and others in the region. However, the new state is under siege by Somaliland and Puntland administrations that have always fought for control of the region. The testy issues of resource allocation through the TFG in the form of scholarships, finances and security for the northern regions of Somalia means Puntland now has to compete with Khatumo and is not in a position to manage such aid on behalf of the TFG. The newly declared state severely lacks infrastructure and this poses a great challenge for the Khatumo administration. Water supply, health facilities, transportation and communication networks do not exist in Khatumo. According to Khatumo officials, only two international aid agencies operate minimally in parts of Khatumo. Airport - The new state urgently requires an airport to provide an income for the region and officials are looking at ways to implement the plan. Khatumo officials currently use other airports located in neighboring regions for official travel as they plan on the construction of Taleh airport which is currently under construction and near completion, according to the president and officials. The administration currently relies on support from the Diaspora and some taxes from residents of Khatumo for state income. Seaport - Sool and Ayn regions do not have a coastline. Sanaag region which has a coastline and the Las-Qoray port is largely populated by the Warsangeli clan who are loyal to the Puntland administration. Clan allegiances will make it extremely difficult for the budding Khatumo administration to establish a seaport in this area or make good use of the Las Qoray port.